My long-walk from Hornsby to Artarmon on Saturday 25 January 2014 would turn out to be my last one for many months. There were a few shorter walks in the months that followed, and then they stopped. This wasn’t due to any crises. Other things came up, like LEGO shows and a new routine of staying up very late on Friday nights (partly to build with LEGO) and not getting out of bed until around noon on Saturdays. As well, there was the notoriously unpredictable weather that plagued Sydney throughout winter. Thanks to that, a couple of planned long-walks had to be called off – Cowan to Hornsby (15.6 kilometres), and Hornsby to Parramatta (20.5 kilometres). Also, the idea of long-walking during winter didn’t have much appeal. Although I sweat like a hog in hot weather, the thought of sweating on a cold day or freezing while I walked was off-putting. So for several months, I put aside long-walking. But as spring approached, I looked forward to getting back into it again. It was a glorious spring day, with a nice afternoon for a walk. So for the first time in ages, I revisited a favourite old trail – across Hyde Park and down Macquarie Street to Circular Quay; over to The Rocks; under the southern end of the Sydney Harbour Bridge and around to the northern CBD; and across Darling Harbour to Pyrmont. That trail takes roughly two hours to complete; it has a wealth of attractions like some of Sydney’s oldest buildings and the Harbour; and I usually finish with a nice dinner in Pyrmont or Chinatown. I couldn’t remember the last time I had walked this trail, but it was still as enjoyable as ever. I also saw someone I had first seen back in 2012 when I had started walking this trail. He was an intriguing sight then and still was today, and in the near future I should finally write about him. After I completed my walk I had a leisurely dinner and drinks at the Pyrmont Bridge Hotel (PBH), and around 8pm I headed home. I crossed the street from the PBH, and just as I began crossing the Pyrmont Bridge towards the CBD I saw a sign that got me thinking. 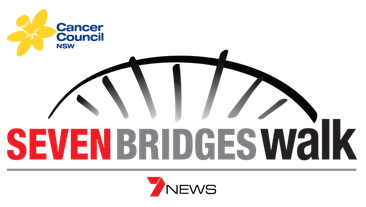 The sign announced that next weekend the Pyrmont Bridge would be involved in a special event – the Seven Bridges Walk. …but now, after enjoying today’s short-walk and keen to get long-walking again, I began reconsidering as I headed home. And later that night, after studying the the route of the 27-kilometre Seven Bridges Walk, I changed my mind. Yes, there was the Gladesville Bridge to cross. As well, although my walk from Beecroft to Rozelle Bay had been 20 kilometres long, I hadn’t walked a distance like that for some time. Also, my two pairs of Colorado boots were starting to look very forlorn. But why not try the Seven Bridges Walk? I was already familiar with much of the route – and it would be interesting to see parts of Sydney I had never been to. Although crossing the Gladesville Bridge had been unpleasant, I had still crossed it – and I could potentially cross it again, especially as the circumstances could be much more pleasant (on a nice spring day, and especially with many other people). And even if I couldn’t, or if I was too out of shape to complete the whole walk, at least I would have tried. And I could just buy some new Colorado boots. There were really no reasons for not doing the Seven Bridges Walk. I waited a few more days to ensure that nothing else would be happening on Sunday 26 October, and then I registered. I had hoped to buy new Colorado boots at a local store, but they were out. I thought about trying other stores in other suburbs, and other brands of boots, but in the end I decided not to (I can buy them online, but that week I didn’t think they would get to me in time). Although the soles of both pairs of boots were wearing down in places, they were still very wearable; my fears of perhaps hurting my feet from walking up to 27 kilometres on semi-worn soles were perhaps grossly exaggerated; and in fact, doing such a long walk in mostly new shoes would perhaps give my feet even worse hell, like blisters. I also planned where to start my walk from. There were two possibilities, and initially the first option seemed to make more sense…but the more I thought about it, the second option (even thought it would take longer to get to) not only made more sense but also presented a fun opportunity before the walk. Finally, by bedtime the night before the big day, I was ready. I set myself up so that I could wake, get ready and be out the door as soon as possible, and went to bed looking forward to what the next day could bring. Would I be able to cross all of the seven bridges and complete the 27-kilometre walk? I was keen to find out. This entry was posted in Action, Hope, Inspiration, Life Challenges, Life is Good, Life Strategies, Travel. Bookmark the permalink.